I love eggplant but was undecided about eggplant parmigiana. I usually prefer grilled eggplant, or cooked in a stir fry. I found this recipe in The Australian Women's Veggie Stars (new cookbook from Gail- see earlier post earlier post on avocado and tomato) and thought it looked good. The cookbook says to use 2 large eggplant, but I used baby eggplant. I find them less bitter, and you don't need to drain the bitterness by putting salt and letting them sit for an hour. 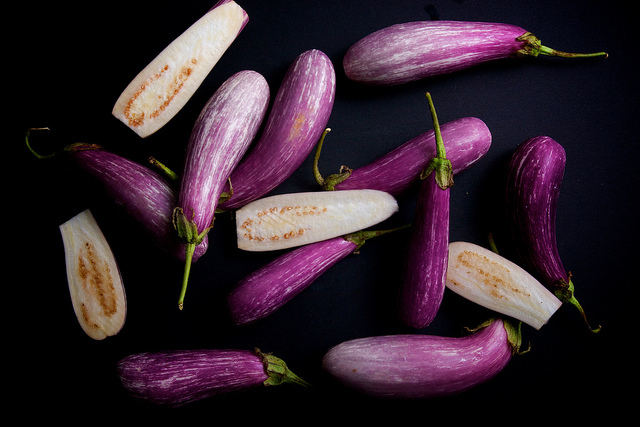 I used to think this type of eggplant was called thai eggplant. 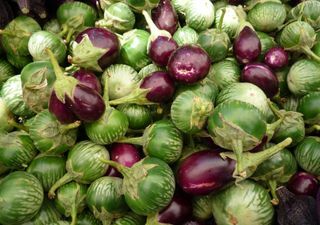 However the cookbook shows all the different types, and it turns out thai eggplant are the smaller round ones (green or purple) as shown below. This recipe turned out really well and was even better as leftovers the next day. I definitely recommend trying it out, with whatever eggplant you have on hand. 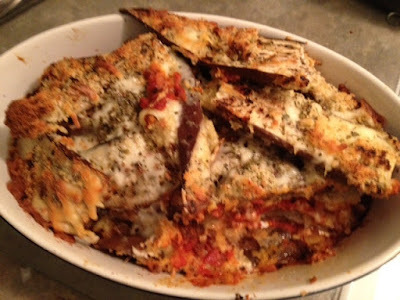 3. coat eggplants in flour; dip in eggs and then in bread crumbs. shallow fry in batches until slightly browned. 6. Bake, covered, 20 minutes. Uncover; bake about 10 minutes or until browned slightly.